A few years back (2009) - I advertised for an entry level accounting position that paid $40k in Dallas. I received several applications from accountants working in CA making 50-55k. Had several phone interviews, everyone of the california residents recognized that going from a salary of $55k in CA to a salary of $40k in Dallas was in fact a pay raise. It's even worse than the graph suggests. Even within states this effect is present. Take my home state of Colorado for example. The cost of living in say Aspen will be closer to that of California, while the cost of living in a small town in eastern CO will be closer to that of Kansas. This is exactly what will happen in California, which recently passed legislation incrementally raising the minimum wage to $15 per hour over several years. The places that will be worst hit by this law are exactly the kinds of places that are least able to absorb it -- namely smaller Central Valley cities and rural areas. These places tend to have higher unemployment to start with and lower housing costs, which tend to be associated with lower wages. Many lower-skilled workers in these places are going to find themselves largely unemployable, or at the very least have their hours trimmed back in order to compensate for the higher cost of hiring them. Not enough is written about the opportunity costs of the higher minimum wage. Businesses will reduce staffing and waits will become longer. Suzy's time will be worth $15/hour on one side of the cash register but it is zero on the other side of it. Not just Suzy's time, but the time of the other six customers (used to be three) is also valued at $0/hour. In Sweden, the minimum wage is $18 an hour so it's impossible to staff convenience stores late into the night unless it's an urban area. To overcome that, a guy has developed a fully automated store where the only human intervention is restocking. It runs off a cell phone APP that you have to sign up for and its monitored by cameras 24/7. This is probably coming to high cost jurisdictions along with an underground cash based economy to supplement income of those on public assistance. "Beyond the basic lunacy of attempting to help the poor..."
But the attempt isn't to help the poor. The attempt is to make people who don't think too clearly think you're attempting to help the poor. MJ, I take it that you are down on California's rules, regulation & attitudes and believe that California's economy will suffer for them. Could you comment on the statistics that seem to say that since 2012, California has done quite well -- and much better than the nation -- in terms of GDP growth, income, and reduction in unemployment? Interesting observation, Coyote. I believe you are saying that minimum wage laws will hurt low-cost (Republican) states more than high-cost (Democratic) states. For example, when deciding a business location, there is less reason to relocate to a low-cost state because the relative cost of wages is higher there. You clearly didn't read my comment carefully, if it all. 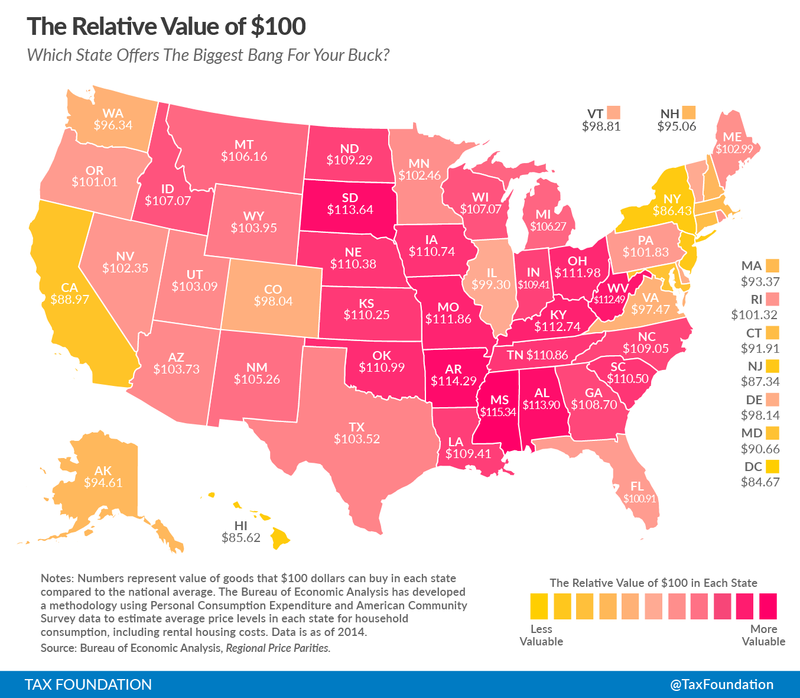 I was pointing to the geographically varied effects that a policy like this can have in a state where there are large variations in the cost of living. The intrastate variation within California could well be comparable to the interstate variation between California and a state like Texas, to which a number of former California business have moved in recent years. Remember that the statewide minimum wage increase in California followed closely behind city-level measures in San Francisco and Los Angeles. The latter was written to given local unions an exemption from the law (I wonder why?). These cities came to realize that they would be putting themselves at a disadvantage by being the only city within a larger urban area with an extraordinarily high wage rate. Consequently, their state reps chose to push a statewide measure in order to put all other cities in the state at a similar disadvantage. San Francisco can probably manage the higher wage without too much adversity, since the poor have already been largely banished from that city due to extremely high housing costs. Los Angeles, on the other hand, is in big trouble. It has large, low-skilled (and hence low-income) black and Latino minority populations who are going be subject to this law, and who are going to find it increasingly difficult to find work in the coming years as the noose of the new law tightens around their necks. As to your comment about California's income and unemployment trends, it's a non-sequitur but I'll address it anyway. California has experienced greater income growth and falling unemployment in recent years largely because it suffered a greater decline during the recession and hence had more room to grow once the slack capacity in its economy was put to productive use. Its unemployment rate is still around 6 percent, or about a full percentage point higher than the national rate. And that is before the new minimum wage provisions were put into effect. Under a $15 national minimum wage, all states will be effectively screwed. The migration of manufacturing from high-cost and heavily unionized northern states took place because of the substantial wage (and in many cases, regulatory) differentials between them. Consider it a large-scale geographically-based substitution effect. Passing a high national minimum wage will cause businesses to look for similar types of opportunities for substitutions that result in large savings. Only now the opportunities for regional migration would be closed. Instead, a likely response will be greater foreign production (something the Democrats have incessantly complained about) or greater automation. At that point it won't matter whether a state is nominally Democrat or Republican. Note as well that California is running up those "better" stats on the back of record state debt of $400 billion (with a "B"). If your credit card has no upper limit, you can live quite well. 1) income tax. Some states (FL, for example) have no state income tax. This makes your $100 stay yours. 2) ease of employment. You're much more likely to HAVE a job at any wage in somw states... FL and TX being prime examples. If you look at California, it is only doing well in San Francisco to San Jose. The rest of the state is doing quite poorly. All the Silicon Valley money is what is bumping those figures. As for Los Angeles, and San Diego, and Modesto, and Fresno - they aren't doing so hot. Mostly because the self righteous in Silicon Valley, pay to get laws enacted to "help us all out." So the upshot is, to save us from energy, and even the hint of an injury, manufacturing has been priced out of the CA market, which is killing Los Angeles, and San Diego. For environmental reasons, water isn't being delivered to farmers, and the state is unwilling to find additional sources - eg peripheral canal - that would give the central valley water, so central valley, except for Sacramento is dying as well. I visited the Bay Area, a few months ago, and indeed it is doing quite well, and shops are bustling, and apartments and condos are being built on any land the eco nuts could not prevent. But live in SoCal and you still see empty shop faces, closed grocery stores, and unfilled malls. In fact last year was a rash of closures, from I think business owners finally giving up, from not recovering from the recession. Note that Peter Thiel gets it. I am experiencing the issue where I live, he talked about it at the GOP convention, being aware of the issue, even while living in the center of economic prosperity. I lived in Arlington about 2 years ago. I do contract work, and end up out of state sometimes (out of California) My salary in Texas was about the same as I could get in SoCal, but goodness, I could get my California house for 1/3 the price that it is in CA - and I don't live in an expensive area in CA either. 140K gets you 2000 square feet on a .2 acre lot with good schools, and the facilities in Arlington are similar to SoCal. I commented below about your comment - having worked a 6 month contract in Arlington, I can attest that my salary was the same, but costs were much lower. Alas, I couldn't convince the wife and kids to move. I also value my time at the other side of the register. It would mean that I shop less as well, and do more shopping from Amazon, even if they do get my 2nd day stuff to me late. All are screwed, but the low income, low cost-of-living states are screwed harder. At the risk of beating a dead horse: The Taguchi Value function is predicated on the belief that systems should be optimized to minimize costs (or maximize value) to the over-all system. Taguchi's inspiration was sparked by plastic film, greenhouses and hail. Much fussy math can be avoided if you cut to the chase, is the US economy better served by a cashier at Walmart making what the market will bear, or is it better served paying the cashier twice that....and having twice as many people (many of whom will command higher wages which implies they add more value to the economy than the cashier) waiting in line? One person making an extra $7 an hour....vs. five more people waiting....and waiting....and waiting. The chart to reference when gLiberals for 15$/min wage start sputtering about "but, but, but in Australia/Denmark/Germany ..."
For me, the effect I'm worried about is the lack of jobs for the young, the teenagers; black or white, male or female. The linkage between working and receiving enumeration was quite clear to me before I was twelve. And I learned a lot too. Heinlein had it down right when he wrote that any man should know how to paint and plant, cook and clean. Doing with your hands and the brain engaged is how you learn. When will these kids learn, and when will their first job happen? After High School, after College, post-grad? When is too late? $15 an hour is too much for a untrained kid, so is $10, $5 seems about right.